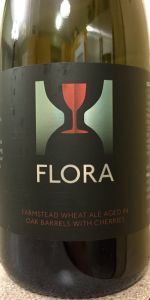 Flora is the wine barrel aged version of Florence (1915-1967), our grandfather's sister as well as the name of our wheat farmhouse ale. Only a few barrels were selected and then further aged on a blend of fresh, hand picked Montmorency cherries. The result is a complex, elegant expression of the annual harvest. This may be the best sour I’ve ever had. It is actually lol. Had on site when I got access to their special availability’s for a friends birthday. So happy I thought to arrange that because this was SO good! Bright cherry funky flavors. Light, fruity and slightly dry finish. I was afraid this fell off but not at all. Awesome stuff!